Coverage logs are typically used by NCover Support for troubleshooting. Logging does not impact coverage collections, and the logs are not normally displayed to the user. From the drop-down list, set the Logging Level to "None", "Normal", or "Verbose". The default logging level is "Verbose", which is the most useful for troubleshooting. These radio buttons allow you to select when NCover will stop profiling and start aggregating the data. Process exits - an execution consists of all app domains created within a process. Collection completes when a process exits. App domains are automatically merged across the process. App domain unloads - an execution is collected for each app domain separately. 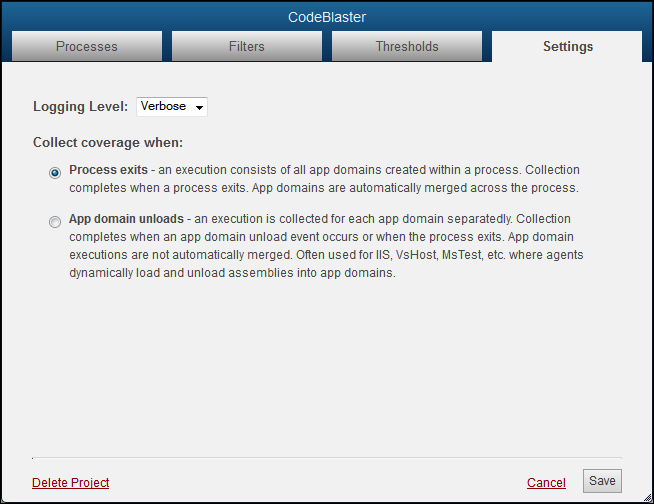 Collection completes when an app domain unload event occurs or when the process exits. App domain executions are not automatically merged. Often used for IIS, VsHost, MsTest, etc. where agents dynamically load and unload assemblies into app domains.